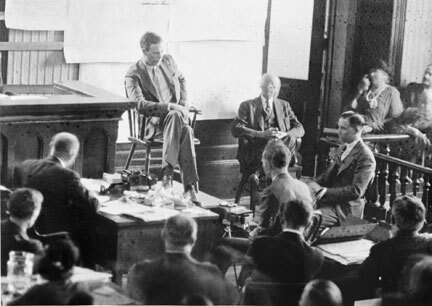 Famed aviator, Charles Lindbergh, on the witness stand during the trial of Bruno Richard Hauptman, later convicted of the kidnapping and murder of Lindbergh’s 20-month-old son. Acts 1:8 is frequently cited as a command of Jesus to evangelize. In a previous post entitled “A Shift of Interest,” this verse was cited by a well-known pastor along with Matthew 28:19 and John 20:21 as justification for inviting people to church on Sundays. Here, I examine the literary structure into which Acts 1:8 falls, and from there, I take an in depth look at the subject of witnessing. Another parallelism is found in verses 3 and 10. A common word in both verses, though translated differently, is parastemi. This, like analambano, is a compound word. Para means “close alongside” and stemi derives from histemi, meaning to stand. Combined, parastemi means to “stand beside.” Jesus stood beside the apostles in verse 3 whereas two angels stood beside them in verse ten. The word, histemi, also appears in Luke 24:36 in which Jesus stood among his disciples and other companions in Jerusalem after his resurrection, as in Acts 1. And in reference to the angels, a similar word, ephistemi, appears in Luke 24:4. Only here, the angels stood beside the women who had entered the tomb of Jesus looking for his body whereas in Acts 1, the angels stood beside the apostles just prior to Jesus’ ascension. Another commonality is that Jesus, having been crucified and resurrected, was “seen” (optanomenos) by the apostles in verse 3. 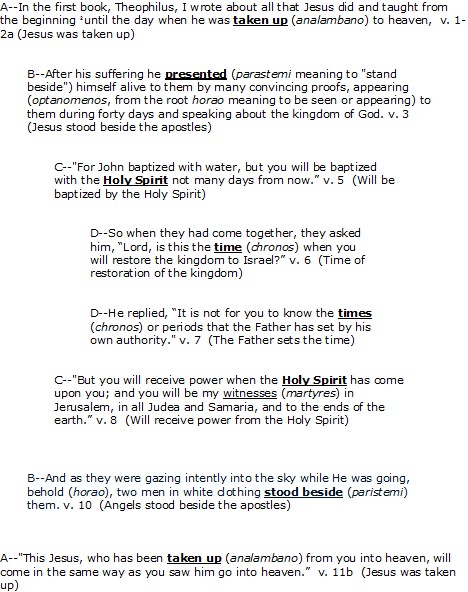 The angels were “beheld” (horao) by the apostles in verse 10. As we approach the center of the chiasm, Jesus reveals the coming work of the Holy Spirit in verses 5 and 8. The Holy Spirit will baptize, that is, initiate the apostles into the sphere of God’s authority (the Kingdom of God) in verse 5. We get an indirect notion of this meaning of baptism by an earlier reference to Jesus “speaking about the Kingdom of God” in verse 3 and the reference to God’s authority in verse 7. When one enters the sphere of God’s authority through baptism, one adopts the mindset, ways and will of the One in whose authority he enters. In verse 8, the Spirit will empower the disciples to be witnesses for Jesus. The Greek for witnesses is martyres, the singular form of which is martus–and is the source of the English word martyr. Strong’s Concordance defines martus as “an eye or ear witness”–one who testifies to what he has seen or heard. When we look more deeply at this word, even across to its Hebrew equivalent, ayd, we find a close association of the witness to the mindset, ways and will of the one for whom he is witnessing, even unto death. Finally, we reach the center of the chiasm. This surprised me, seeing that what attracted me to read this section of Acts was the concept of witnessing. I presumed that, given the attention in churches to verse 8, and the call upon believers to become witnesses for the Messiah, that it would find its way into chiasm’s center. I also felt that verse 8, following the disciples’ inquiry about the restoration of Kingdom of Israel in verse 6–something predicated on God’s unilateral action through His messiah–would serve as a contrast to that insofar as it asserts the working of the Spirit through men. But when I threw off my own presuppositions about this passage of Scripture, something else emerged as the central point. A common word shared by verses 6 and 7 is chronos, meaning time. In verse 6, the apostles asked Jesus “is this the time (chrono) that you will restore the kingdom to Israel.” The answer to this question spreads over the next two verses. Jesus replied: “It is not for you to know the times (chronos) or periods that the Father has set by his own authority. But you will receive power when the Holy Spirit has come upon you; and you will be my witnesses (martyres) in Jerusalem, in all Judea and Samaria, and to the ends of the earth.” So, while Jesus’ disciples, empowered by the Holy Spirit, will participate as witnesses (martyres) in the restoration of Israel, God reserves to Himself the authority (exousia) to set the time. The time of restoration is the exclusive domain of the Father; He unilaterally acts to set it. This should not come as a surprise. God is the God of time: “Let there be lights in the expanse of the heavens to separate the day from the night, and let them be for signs and for seasons and for days and years.” (Genesis 1:14) He did not set times through human hands, rather He alone created “lights”–the moon and the Sun–for this purpose. Let us take a moment to explore the subject of witnessing. When we think of witnessing today, what image swirls around in our minds? More than likely, a courtroom. In this picture, anyone could be a witness so long as 1) they report what they saw and/or heard–an eye and ear witness–and 2) if they swear on oath that what they report is true. Literally anyone qualifies as a witness under this definition–a stranger at an intersection can bear witness in court to an accident in the middle of the road. We don’t need to know anything about the witness, nor does he need to know anything about the people he’s witnessing in the act of something. Knowing the participants in the accident, or being in relationship with one or more of them might make his “testimony” prejudicial, disqualifying. The character and/or background of the witness is more often than not, inconsequential. The character of the witness is often treated as less important than the testimony that the witness offers. Criminals, for instance, are frequently brought forward to testify against other criminals. Is our modern understanding of being a witness on a par with witnessing in Scripture, most specifically in the writings of Luke? The root word, martus, and its various forms as a noun, is found 35 times in the New Testament. Luke uses this word twice in his gospel and 13 times in the Book of Acts. It would, of course, be far too ponderous in this brief article to cover every context in which Luke uses the word. A question that we desire to solve, however, pertains to whether this is a command of Jesus, and more specifically, is it a command applicable to all believers equally and on top of that, does it serve as a justification for inviting people to church services on Sundays. Who, then, does Luke associate with the act of witnessing? At the end of Acts chapter 1, the disciples discuss the selection of Judas Iscariot’s replacement. Line 1:22b uses the word, martyra (witness), in reference to selecting Judas’ replacement: “One of these must become a witness with us of His resurrection.” Who is “one of these?” The answer to this “who” question lies in verse 1:21 and line 1:22a: “Therefore it is necessary that of the men who have accompanied us all the time that the Lord went in and out among us–beginning with the baptism of John until the day that He was taken up from us.” The one who will bear witness to the resurrection of Christ is not simply someone who saw the resurrected Christ or someone who heard about it and passed along the information, but one who “accompanied” (sunerchomai–one in the company of) the Messiah as well as the other disciples, over an extended period of time, “beginning with the baptism of John until the day that He was taken up from us.” The witness is an intimate of the Messiah and the disciples. In Chapter 10, a similar theme repeats regarding who witnesses. In this chapter, Peter is summoned to the house of the centurion, Cornelius. In delivering the message about Jesus, Peter uses the word, witness, three times. In A, we have references to both apostolic and prophetic witnessing, pointing in B to the identity of those who witnessed the resurrected Christ. It was not to “all the people” that Christ revealed Himself, but rather to a chosen group of people “who ate and drank with Him after He arose from the dead.” These were also largely the same people who ate and drank with Him before the event at the cross. Far from not knowing the person for whom they were witnessing (as we might find in a modern courtroom), those referenced here knew Jesus intimately. Who is a witness? Not just everyone who proclaims themselves a Christian, but people in a close, intimate relationship with Jesus. Take note here that the persons in verse 32 who do the witnessing are teaching “in the name of Jesus.” (v. 28a and 40b) That means, as I have previously mentioned, that these witnesses have entered the sphere of God’s authority, taking on the mindset, ways and point of view of their master. Additionally, they obey God, not men. (v. 29a, 29b, 38b and 39) The persons who witness are closely aligned here with the will of God. The character of the witness is far from inconsequential, but is central to the act of witnessing. The Holy Spirit, according to Luke, is both a witness–itself a character reference of the highest order–and is “given to those who obey Him.” The connection between witnessing and obedience to the ways of God is made clear in this literary structure, as it also is made clear in the parallelism of Acts 1:5 and 1:8. In the literary structures examined above, who is a witness? It is not someone in today’s usage of the term–someone who shows up in church, hears a couple of things about Jesus and then is instructed to tell his family, friends and neighbors those things and invite them to come to church. Rather, a witness is one who is both in a long-term relationship with Jesus and who obeys God. In Luke 24:51, Jesus is described as being “carried up” into heaven. “Carried up” is anephereto–a compound word. Ana means up, phero means to bring or carry. It is the only instance in which Luke uses this word. In Luke 24:46-48, Jesus exhorts his disciples to be witnesses (martyres) of the life, death and works of the Messiah: “Thus it is written, that the Messiah is to suffer and to rise from the dead on the third day, 47 and that repentance and forgiveness of sins is to be proclaimed in his name to all nations, beginning from Jerusalem. 48 You are witnesses[of these things.” The words, “in his name,” epi to onomati, indicate an acceptance by he who proclaims the name of the Messiah’s mindset, ways and will, thereby connecting the act of witnessing with obedience toward the Messiah. A very closely related word, martureo, with the root, martus, is a verb found in Scripture 76 times, once in the Gospel of Luke, and 11 times in the Book of Acts. It is translated either as to bear witness, testify or give a good report. Richard works expertly through a number of chiasms here. 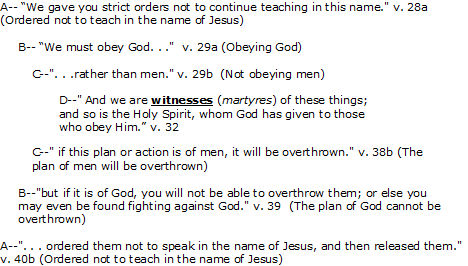 I want to refer to the chiastic middle in Acts 5: (D, “We are witnesses of these things and so is the Holy Spirit….”). The strength of Peter’s defense (before the Sanhedrin) rests on the two-or-three legal dictum for witnesses (Deut 19:15; Mat 18:16; 2 Cor 13:1). Jesus himself appealed to this precept (Jn 8:17,18). Let us not forget that Peter’s legal defense is part of his argument that he was a living witness of the resurrection of Jesus and therefore a truthful proclaimer of it. How does the Holy Spirit fit into this? Luke (who also authored Acts) tells us that Jesus begun and ended his ministry as a prophet who was led and empowered by the Spirit (Luke 4:18-27 and 24:19). And so were the disciples of Jesus (24:49; Acts 1:8; 2:1-4, etc). But Peter says something more about the Holy Spirit. He was not only their Equipper; along with the disciples the Holy Spirit Himself was a Witness “of these things.” The core of the disciples’ message was the resurrection of Christ. Peter anchored the authority of their ministry on the truth that God raised Christ from the dead (Acts 3:15-16; 4:33), a fact that the Sanhedrin cannot dispute (4:16). The point I am making is that the “witness” that the disciples were making – and the Holy Spirit likewise – was not only in (mighty) word but also in (mighty) deed. The second point I want to make is the fact of divine validation of the disciples’ witness. The resurrection of Christ was God’s validation of His life and message (Acts 2:32,36). As the glorified Christ stood with the persecuted Stephen in his final moments, approving his defense (Acts 7:56) so the Spirit stood with the disciples as co-witness before the Sanhedrin, validating their message. The Holy Spirit was given to the early believers (Acts 1:8) and to “all who obey God,” equipping them for witness. The early Church did not need the Sanhedrin to validate her witness. The Sanhedrin rejected God’s witness among them. The Sanhedrin did not have the Spirit of God. The apostles were living witnesses of the resurrection of Jesus. They were with Jesus before and after the resurrection. But they were all cowering in fear UNTIL the Holy Spirit came upon them! Then not even the might of Rome could stop them (Acts 8:4). Jesus promised the same Spirit to the Church (1:8) “whom God has given to those who obey him” (5:32). “God anointed Jesus of Nazareth Holy Spirit and power, and he went around doing good and healing all who were under the power of the devil, because God was with Him with him” (Acts 10:36). And before Jesus ascended to the Father He gave this command to the disciples through the Spirit: “I am going to send you what my Father has promised; but stay in the city until you have been clothed with power from on high” (Luke 24:49; Acts 1:2; cf: “As the Father has sent me, I am sending you…. Receive the Holy Spirit,” John 20:21,22). This kind of “witness” (literally, martyr) does not only put one’s word at stake but also one’s life.